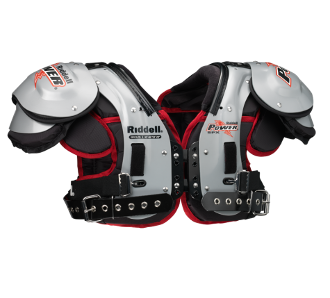 If you’re a lineman who’s looking for a shoulder pad that allows for maximum movement of the shoulders, the Riddell Power SPX Adult Football Shoulder Pad – Linemen is what you’re looking for. Engineered to endure the dirty work up front, the SPX Lineman Shoulder pads are built to withstand high impact hits and are recommended for both offensive and defensive linemen. Its discrete body composition, mid length swim cut arches and swivel fronts allow these pads to move in unison with your body and cut down any interference other pads may cause. Riddells air management system allows for increased ventilation to keep you cool and collected on the field. The 1 1/2” BIOTHANE belt with 1 1/2” elastic strap and STAC shoulder system will give you the piece-of- mind needed to be a star!